Look at the crochet scarf I just made! It is pretty light and soft because I used Lionbrand Heartland Tweed yarn, one of my favorite for scarves and beanies. The specks of color add interest to the yarn and this color combination will go well with any winter ensemble. DH agreed to serve as my model as long as I did not show his face ( ! ). I worked on this scarf for one evening because the pattern was very well written and easy to follow. As you can see, one side is the mirror image of the other. I had the yarn in my stash so I just picked two colors which went together well and began working. My favorite way to crochet scarves is lengthwise so this pattern was perfect for me. The hook was 6 mm, chosen to make the project even softer as the stitches turned out bigger. 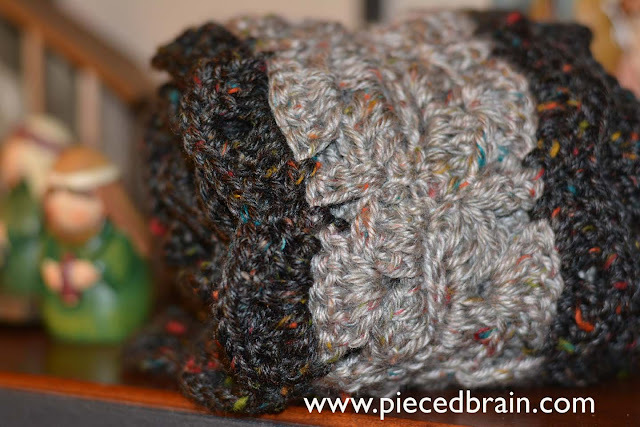 Although the pattern recommends, I do not check the gauge unless I am crocheting a garment. Thus, I change hooks depending on the results I want - softer or sturdier. 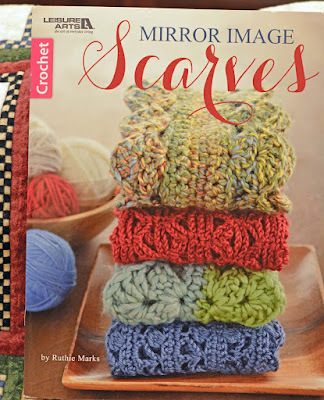 The pattern I used is called "Borders" and it is the first one in the book Mirror Image Scarves by Ruthie Marks, published by Leisure Arts. Ruthie's eight designs are very creative: some remind me of borders I made in projects a long time ago, others have a lace-like quality to them, while others still are reminiscent of my landscape in Utah with scallops mimicking the high mountains. You are bound to find a design (or 6, in my case) you must make! Ruthie Marks has a long history of designing crochet projects and writing crochet pattern books. Thus, her instructions are clear, precise, and yield projects looking just like hers. 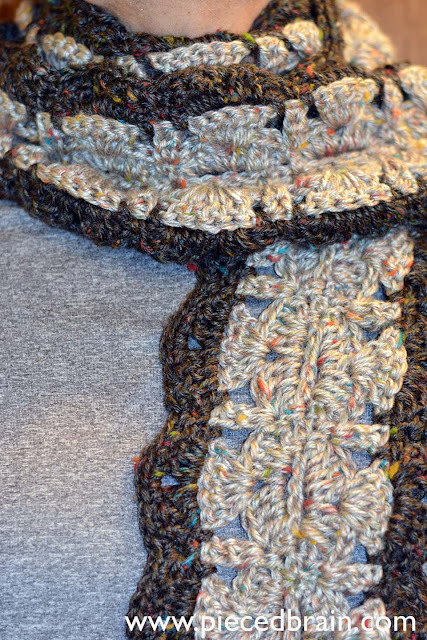 The cool symmetry of the mirror image construction in her latest book lends a modern feel to crochet scarves. 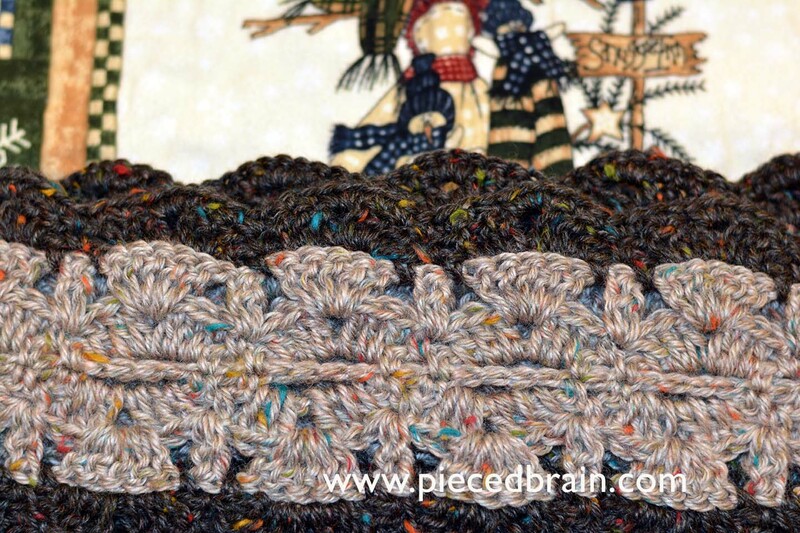 The best part: once you memorize one side, the second one is crocheted like a breeze! And so, this scarf was done in no time at all. When I forgot how to make a stitch (after 31 years reading patterns in English, I still revert to the names of stitches in Portuguese when I begin a project and am not sure), I looked in the General Instructions section at the end of the book where diagrams were straightforward. Oh, there is a fantastic feature in Mirror Image Scarves: the camera icon next to a stitch reminds us we can check out Leisure Arts technique videos if we get stuck - yeah - making this book a perfect gift for budding crocheters, too. Winter is on full blast and I hope our friends on the East Coast and Mid West are keeping warm. I have been staying indoors most of the time because of my cold although Toby the dog has managed to get me out of the house a few times so he could check out what is going on in the neighborhood. I have some more quilt patterns to write but, in the evening, I will begin my second scarf from Mirror Image Scarves because I've already made a list of recipients for them: soothing projects for me, great gifts for them. Can it get better than this? Craftsy has a great sale on crochet yarns right now so if you are ready to make the mirror image scarves and need new yarn, check it out. So pretty and looks so warm! oooo - THat's so pretty! It looks much nicer with the two-tone bordering as you've done there. 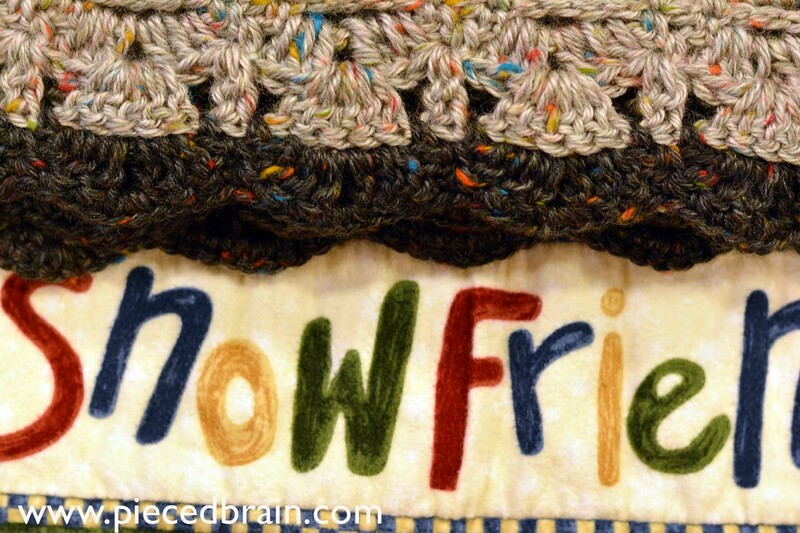 Love that specked yarn.